I attended the Waste Symposium at Merrick Hall last Friday. For those of you who did not have the chance to attend such, this book was an adequate representation of nearly everything that went on generally speaking. I very much enjoyed the style of Humes, and the thoroughness with which he present the information. Overall, Garbology is an excellent book. There is a strange tension between the individual and the collective present in this book. Garbage and waste are things that all of us produce individually, and yet effects us all collectively. And even though he reverts to a rather simplified cultural argument (the mass media makes us consume more), I think a lot can be said about the political and economic decisions surrounding the way we deal with trash. Indeed, waste is not an apolitical topic, rather it is a byproduct of consumption (something inherently political). Waste, even when handled by the private sector, needs to be monitored and supervised by local, state, and federal levels of government. Yet the government cannot limit consumption…Can they? And if the government cannot limit consumption or enact policy to change our consumption habits, can we adjust our habits on our own? What sort of oversight and “punishment” can we use to enforce a change in consumption/waste habits? Garbology by Ed Humes was very interesting. It has brought many startling facts and unique stories to my attention. I have some prior knowledge of food waste and knew that was a problem, I also knew the benefits of recycling, but I never fully comprehended the scale of the trash problems the US now faces. “Garbage has become one of the most accurate measures of prosperity in twenty-first-century America and the world.” This quote is spot on, the US is the most wealthy nation in the world according to many standards. It makes sense that the more wealth someone has, the more they consume, and the more they produce waste. 7.1 pounds per person per day, Average lifetime trash is 102 tons, US citizens have 50% more trash per person than other western nations. Puente hills emits 31,000 cubic feet of gases per minute. by 2011, 500 feet above original ground level. Trash Crisis: Number of authorized landfills have decreased, and the are filling up. Where to put all the trash now? Archaeologists know we are not what we eat, but we are what we throw away. Landfills are forever… Ancient civilizations are studied by what they leave behind. It is weird to think that in thousands of years, other civilizations could be studying and uncovering what we throw away today. Waste management people didn’t start containing bottom of landfill until 1988, so there a millions of tons slowly seeping into ground and could be very harmful to ground water. 1991 liners became required. It seems like common sense now, but it is crazy to think that no one back when landfills started ever thought of the consequences or the impacts trash could have on the surrounding and below environments. “blogjects” and “spimes” and smart trash… Humes brings up science fiction of self-aware trash and it is very interesting. In a world of internet and sensors, trash items could have technology on it that ensures it goes to the right place of disposals. What if every plastic bottle had a built in micro chip that trash separating robots could sense and put it into the recycling pile? That would keep all bottles out of landfills. Its already kinda happening in Seattle with Tim Pritchard and Trash Track. Green Cities like Portland still produce massive amounts of trash. Diversion rate of 67% but still behind San Francisco at 77%. But even with the high recycling rates, 60 trucks a day go to landfills. Enter: garbage death ray. Reducing garbage up to 99%, the trash crisis is solved.. almost. Garbology, by Edward Humes, discussed one of the main problems that we have our society today, and that is waste. We as people are producing too much waste and we need to figure out how to get rid of or reduce our waste. It was a great book to read and I found many interesting facts/points. The book was divided into three parts, the biggest thing we make, the trash detectives, and the way back. One out of every big truck in the United States is a garbage truck (6). U.S. has 5% of the world’s population,. but accounts for 25% of the world’s waste. America accounts for a lot of waste and it is ridiculous for how small of a population we have (10). The chart of where the trash goes by country is very interesting. for the United States, 69% of our trash is in landfills, 24% goes to recycling/composting, and 7 % goes to incineration. When it is compared to Germany, 0% goes in landfills, 66% goes to recycling/composting, and 34% is incineration (27). Comparing the Recycling, Germany is still more sufficient in recycling unlike the United States. This comes to the question of why do people burn trash. Burning trash is terrible because of the chemicals that emit. Backyard trash emits dangerous levels of dioxins, soot and fine particulates, and polycyclic arromatic hydrocarbons (PAHs) (53). Incinerators was a problem for New York City during the 50s and 60s. New York boasted over 17,000 apartment building incinerators which casted a huge smoke throughout the city (54). The idea of smart trash, would be in a world in which zero waste stopped being a distant dream. E-waste has been a problem as well. These kind of items have to be disposed of properly. Cell phones and keyboards are the most generated items and they are also the most disposed (155). It’s interesting that studying the garbage can produce some info. 2 years after the rise of AIDS, the amount of condom wrappers rose 45% (167). The history of the plastic bag was interesting. They were introduced in 1957 to replace wax paper. In 1966, plastic bags began to replace paper bags. In 2005, San Francisco began to impose laws on implementing fees for using plastic bags.(217). The plastic bag has been useful. My family has always used plastic bags, but we always save them. We reuse them for many things, and have never used paper bags. Here you can see the Iceland Ice sheets. In this news article you can read that the winter of 2015 so far has lead to a net increase in mass in one of the Glacier. This is important since 1993 there has not been an increase in the amount of ice. This could be a good sign in the war on climate change. This would have to be proven over more years and this whole winter but it seems to be that we will have increase in Icelandic ice sheet masses. Ch. 7 The Trash Trackers!! Surprising facts about landfills were discovered? It showed that we can learn a lot form the garbage a person has. There classification scheme of numbers to code their findings in the trash. Trash burning!! Good or Bad?? Simplistic living is the way of the future but are we ready for it? Jk, it was bad play on words. 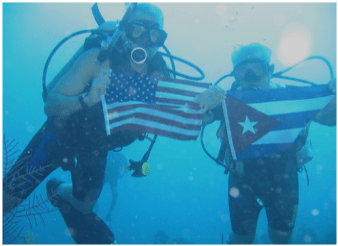 But huge news between the US and Cuba this week, both countries signed an agreement to join forces in protecting the coral and vast array of fish that live in the shared ocean between the two. It is the first environmental diplomatic agreement since the US decided to reopen relations with Cuba. The agreement allows scientists and researchers from both countries to collaborate on preserving similar marine ecosystem reserves. “Fish, marine mammals, sea turtles, birds and other marine life exist in ecosystems that rarely fall within maps drawn by man,” said Jonathan Jarvis, director of the U.S. National Park Service. Cuba has some of the largest untouched coral and marine ecosystem reserves, but they could be in danger with an increase in tourism to the country. Havana will host the 10th Ocean Sciences Conference this week where scientists from the US and the rest of the world will meet to talk about climate change. This article discusses the increase population of certain animals, and how they are taking over their environment. With these increase populations, officials are suggesting people to eat more of these animals. The lion fish, has become native to the east coast/ Caribbean area, and they are known to destroying other species. The lion fish eats so much that they bring the decline of other species, and they then resort to cannibalism. Officials are asking for fisherman to capture them more, as well as restaurants serving them more on their menu. You are currently browsing the Environmental Geography blog archives for November, 2015.